Groverburger's Super Simple 3D Engine (SS3D) is my take on simplifying love 11's new 3D capabilities into a ready-to-use library for simple 3D games. Just drag the engine.lua file into your project directory to install. SS3D does require CPML, which can be found here. Download the latest version on Github, or as a .love attached to this post. Github link at top of this page. Here's an example of what can be done with this engine. This is a Minecraft clone I've beem working on. I abstracted the engine I used for this project and that is what became SS3D. Feedback and suggestions are greatly appreciated! Feel free to use SS3D for whatever no permission necessary. This code is offered under the MIT license. Last edited by groverburger on Mon Apr 01, 2019 7:44 am, edited 2 times in total. Wow and wow. That's a very impressive work. 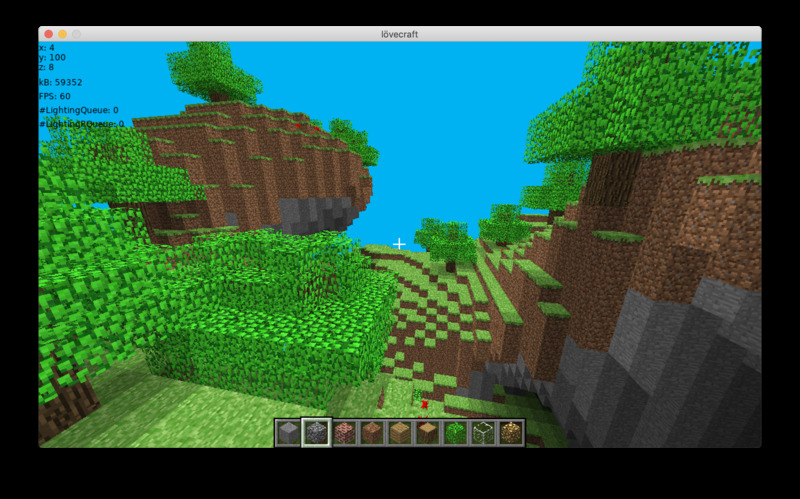 Map generator including strata and trees, collision handling, very decent lighting with light propagation. Great job. The name was already used for a 2D game (also here but that's just an early test). As hinted in that thread, that name suggests darker contents, which is a bit of a problem. Another problem is the lack of any license text and copyright statement in the repository. Legal stuff is damn boring to handle, but needs to be sorted out correctly if you want it to be of any use to others. Also, are the assets yours? Are they under the same license? Unless they are yours or public domain, that is a problem as well, because there are no credits or license statement for them in the repo. In case they are not free, note there are free assets in the Minetest repo (CC BY-SA, see license for details). Thanks for the compliments and feedback! I was sure the name Lovecraft was already taken. If that causes too many problems, I may change it in the future. I'll be upfront that I currently know very little about legal stuff and licensing or how to apply it to my creations. I want SS3D to be free for anyone to use in their creations and even sell without problems. The engine.lua file was created entirely by me so that shouldn't be too much of an issue. In Lovecraft, the things I used but didn't create myself are all the textures and gui sprites (all stolen from Minecraft directly), and CPML. I should give credit to CPML and I could change the textures to Minetest textures as you said, but Lovecraft is intended to be an open-source hobby project so I don't think Microsoft would cause me any problems regardless. I'll do some research on the topic. Thanks again for your feedback. It's not really hard, a quick way is to just include a LICENSE.md or .txt in the repository with the copyright and the license text, and mention in every file that the license can be found there. In the CPML directory you already include one: https://github.com/groverburger/lovecra ... LICENSE.md but that's the CPML license only, obviously. You can use it as a guide, but note that the authors have forgotten to comply with the BSD 2-clause license: https://github.com/Nition/UnityOctree/b ... er/LICENCE which also requires the license text to be reproduced. I've filed an issue about that in the CPML tracker. Awesome stuff! This will be my goto library if I ever want to make a 3D game with Löve! Can't wait for lighting and .obj import. Perhaps you could add collision handling too! Thanks for the support! I'll make sure to do that when I migrate SS3D to github. Thanks for the compliments and feedback! I have some simple diffuse lighting working but it's not polished yet, it should be making its way into SS3D sometime soon. CPML has some really handy 3d line to triangle intersection functions that work well for collisions. I'll put collision handling on the todo list, but in the meantime here's a simple collision function I was testing using CPML. The ray.direction represents where the object will be next frame, and the function tests if the line from where the object is now to where it is next frame intersects with any model in the CollisionList. It may still have some bugs. Proper licensing added to the repositories. Lovecraft and SS3D are both now under the MIT license.